Alright guys, bear with me. This is going to be a rather lengthy review. If you read my Grindhouse review then you'll know that all of my Taratino reviews are a bit on the lengthy side. If you've seen a Tarantino movie then you know that my reviews need to be a bit on the lengthy side. I suppose to better understand Inglouious Basterds you need a knowledge of the man behind the event. Quentin Tarantino has been directing for about 20 years now and in those 2 decades he's directed 7 films. After his first film, "Reservoir Dogs" he was touted as the next big thing and lived up to that 2 years later with the classic "Pulp Fiction". His next film "Jackie Brown" proved to be not so successful but by that time Quentin Tarantino was a household name. Recently he's come under fire for being too in love with hearing his own voice. He's always written his own films and with the exception of Jackie Brown they've all been original ideas. And that's how it should be. Quentin Tarantino would get bored directing a script not written by Quentin Tarantino. I feel that all the hate recently is not the product of his films being poor but hate because he's no longer "in". After Pulp Fiction he was the savior of modern cinema and by Death Proof he was a narcissistic jerk that only directed movies that had a "hey look at me! aren't I clever?!" attitude about them. Through this time I've been a huge Tarantino fan and have held the exact opposite stance on all of these issues. There's a lot of talk about Tarantino the director and Tarantino the writer. Most people love the director but can't stand the writer. This brings us to "Inglourious Basterds". Tarantino is a genre director through and through. He's done crime thrillers, con movies, revenge pictures and a slasher flick. This is his take on the war film and more importantly the "guys on a mission" sub-genre of the war film. Inglourious Basterds is what would happen if Quentin Tarantino ran things in World War 2 and wanted it to feel like a spaghetti western. The film follows Lt. Aldo Raine (the fantastic Brad Pitt) and his group of Jewish American soldiers as they try to take out the entire Third Reich at a huge propaganda film premiere in Nazi-occupied France. This is a tough film to review. I almost feel like we would all benefit more from a multi-part in-depth analysis of this film because that's how layered it is. 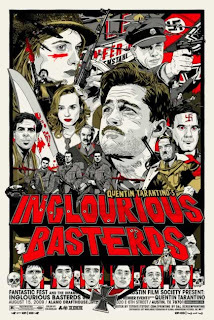 Inglourious Basterds is one of the best films of the decade and should signal a revival in the career of Quentin Tarantino. This is hands down his best film since Pulp Fiction and could be considered his masterpiece for years to come. Because this is a Tarantino picture you can expect it to have more in common with Reservoir Dogs than Saving Private Ryan. It's being touted as an action picture but there are only a handful of scenes with actual gunplay. The rest is left to the viewer's imagination. But when the violence does happen the violence happens BIG. This Tarantino's most violent picture to date. Kill Bill Volume 1 is an extremely gory film but the amount of fake blood that movie is drenched in reaches Looney Tunes levels of over the top. On the other hand, Basterds is brutal and visceral and realistic. Like I said, there isn't much but when there is expect to be a little uncomfortable. Violence has never been the point of a Tarantino film though and like always, the dialogue is fun and hilarious and thought provoking all at once. Everyone turns in a fantastic performance and I wouldn't be surprised if this picture picked up a few Oscar nods next year. The two shining stars of this film are Brad Pitt and his foil, Christoph Waltz. Pitt plays Lt. Aldo Raine, a backwoods good ol' boy from the mountains of Tennessee with a huge scar carved into his neck and some bitterness toward Nazis. The sheer brilliance of his performance kept me engrossed for the entire runtime and anytime he was on screen I was giddy. On the other end, Christoph Waltz plays Col. Hans Landa, a man whose nickname is "The Jew Hunter" and whose disposition is acerbic and charming all at the same time. Watlz is a truly terrifying villain and plays his character with such menace that I feel a supporting actor nod is definitely in the near future. The rest of the cast is fantastic as well, including Eli Roth as Donny "The Bear Jew" Donnowitz who enjoys beating Nazis to death with a baseball bat. If I have one complaint about this film it's that we don't get enough backstory for Raine and his Basterds. Outside of that, Tarantino is back and this very well could be his masterpiece. This is my third 10/10 this year and it comes only one week after my 10/10 for the brilliant District 9. I don't know what it is but the end of summer has been fantastic and I don't know how the rest of the year will top this month's releases.